I've spent the past four weeks with a group of eight fun, passionate students and a dedicated instructor (as well as a few others generous enough to record some of our great times. We've traveled throughout Southern Louisiana, exploring, reading, writing, and enjoying the mystical pleasures of this strange land. Below are some of my favorite experiences, why they hold special places in my heart, and how the bookpacking adventure enhanced its impact. I don't know how to draw alligators. We took a mini break away from bookpacking and went to the Audubon Zoo! The zoo experience overall was a time full of relaxation, playful exploration, and "joie de vivre." The gang definitely had moments where our "inner child" came out and roamed free. The fam and I first came across the entrance of the Audubon zoo and took pictures of the beautiful statue of the great French naturalist, bird watcher, and painter, John James Audubon. Surrounded by fecund wild sunflowers, we protected ourselves under the sun's stinging rays as we took a moment to take pictures and smell the fresh flowers. After the tickets were covered, Andrew gave his logistical presentation of the day. After he asked if we had any question, I immediately exclaimed, "flamingos!" and headed straight for the gorgeous exotic animals (I've always wanted to possess one when I was little). I goaded the precious animals along and beckoned them to come into the water. Subsequently, the gang broke off in all different directions and I partnered with my good friend Alfredo to check out the rest of the zoo. Let me just start off by saying that the Audubon Zoo is incredible. This zoo is larger and hosts a wider variety of animals than any other zoo I've been to in California. The zoo is subdivided into four sections, possesses larger animal pens, lakes and forests, and even hosts a swamp tour section with alligators, snakes, and turtles! We dashed away from the group and watched orangutans, finches, gazelles, and elephants lie lazily, eat grass, groom themselves and their mates, and fall sleep. Apparently, human beings are too boring and petty for these complex creatures. Some were amongst their family, some were amongst their friends, but all the little wild creatures were nested in their big pens. The elephants didn't care to see if we were watching them or not. The elephants were facing away from us and grubbing on grass while the orangutans swung carefree on the logs in their jungle pen. The finch birds had a haughty alert look, which made Olivia respond with a self-deprecating remark, "Please forgive me for my ill-mannered human friends." Although the gazelle family was turned away from the visitors, the family looked so powerful and majestic. After we finished the Asian wildlife region of the zoo, we found ourselves in the heart of the zoo once again. I took some brief pictures of the elephant water fountain near the palm trees just to get a feel for adventure. Then, we chatted and took some photos with some ancient turtles. Next we meandered over to the primate section and discovered the most fearsome yet lovely animals in the zoo- the gorilla and baboon. 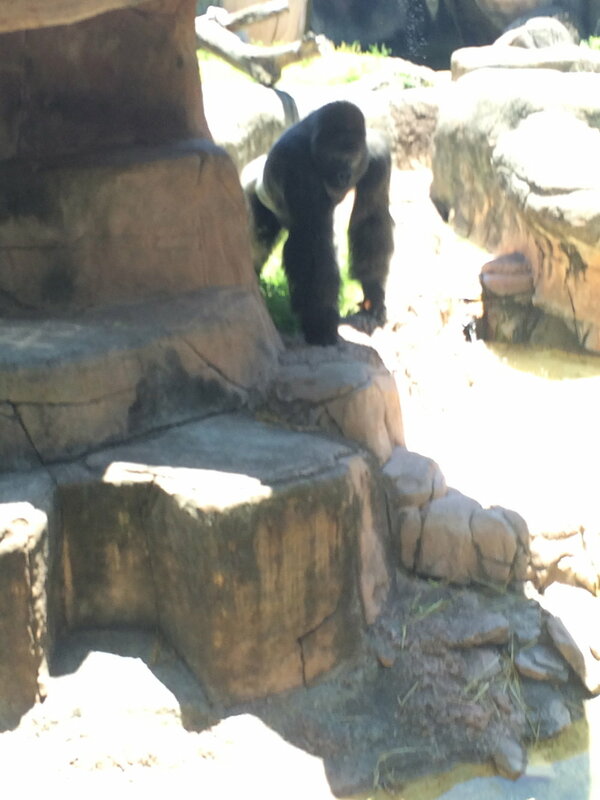 There were three gorillas (one adult, two children) and two baboons (both adults). The animals were relatively shy around the large crowds especially the alpha gorilla that stayed huddled in an upright fetal position. The animals looked a bit creeped out by all the human eyes peering at them, yet they handled the situation with grace. I reached for my phone and saw the group message on the WhatsApp group chat. Supposedly, we were to meet everyone at the Zoofari Cafe at 3:15pm, which didn't happen and Alfredo and I moved on to the bird aviary, safari, and then eventually the swamp. The aviary hosts more than 30 species of beautiful birds abound at Audubon Aviary. I thought the lakeside was a neat feature that housed turtles, birds, and various fish. the safari and contained an adult anteater that slugged around its pen. Then, I stumbled on our sleepy tiger friend and called Alfredo to come look at the tiger. For some strange reason, the tiger would not get up for the little children and the nervous adults who crept beside the window pane. So I sat down and cajoled the tiger into getting up, "Oh you're so cute and precious, you strong, big tiger you! Aha." The tiger eventually rose up and peered up at the glass, which attracted smaller children. Yet, as quickly as it rose up, it went back to sleep again. We went deeper into the safari and headed towards the swamp. There was something about the staged tameness of the zoo that made me feel uneasy and sympathetic towards the animals. I sang in my head, "Roam little animals of God, roam all you wild ones, roam all you little critters, all you creatures of the day and all you creatures of the night, find a habitat in nature, run free from your human masters, don't entertain this human zoo, defy human reason and return to your homes." The parrot however caught my attention too soon. Alligators are so cute! The one below is an albino alligator that just wants to be my friend. I showed Olivia this picture and she said, "It looks like it wants to tell you something, but it's smiling and closing its mouth in a forced and secretive way like I have something to tell you but I'm going to keep my mouth secretly closed." I deduced this was confirmation that the alligator wanted to be my friend, but didn't know how to use its words to tell me its true desire. However, I was awfully unsure about the compatibility between me and the other rotund alligators in the swamp. They look very intimidating and hungry. Here's the short little youtube clip of the big alligator! On our way back to the crew, we saw these little rascal raccoons and we were off to our hotel in the city! who’s mission, first and foremost, is to find the class a gator. maybe why he has on call his own decanter ‘o deans. for he was born a Brit. Remember if he’s off one day, shrimp o’boys will do the trick. Andrew was a great guide for our adventures around Louisiana. It was great to have an outside perspective on U.S. history, him having been educated in the UK. I am so thankful for this experience, and I owe much gratitude to Andrew for having created this course. Special thanks to Andrew for working so hard to find the class an alligator in its natural habitat. We went on swamp tours, in different marsh lands, down backroads, and had such rotten luck. Then on our way back to New Orleans after our last attempt, after we had given up hope, we found two! Classic. Andrew - Thank you so much for this experience. I wouldn’t trade it for anything. a jokester much needed in the miserable muggy heat. but who would ever know that? Oh right! For she mentions him at the drop of a hat! than all of her peers. Glasses up to Liv - Cheers! Good luck to you in your last year. Liv was my last roommate. It took a while to get to know her, but she is hilarious. I think back to the days in Grand Isle when we were strangers, and I laugh. At that point I knew her only as my oldest classmate who had a special gift for spotting interesting wildlife. Now I think of her as the one who made each day of the trip entertaining with her witty commentary. One big thing about Liv - she loves her cat, Tommy, to wits end. Now anytime I see anything to do with cats I think of Liv. As a rising Senior, she only has a year left, but I hope that this was not the last I’ve seen of her. then she came out of her shell and I was met with an infectious smile. Try a night out with this one and I promise you will have a gas. when she calls you out on your b.s. today. And she will, always. Ogechi was so quiet in the beginning when we started off in Grand Isle. She roomed with Morgan and I, but I swear she was always either sleeping or reading. I knew that she had great work ethic, but what else I was not sure. Not before long did she come out of her shell and it was amazing. Ogechi is a ray of light and laughter. She made each day that much more enjoyable. Even if you are terrible at making jokes like me, she will laugh, and then lean on you because she laughs with all she has. Her laugh is so infectious that then everyone else will start laughing too. Ogechi - I will miss your laugh and your tendency to break out into dance whenever you hear music. he just wants to get up on the dance floor and move his happy feet. if you wont hate me too much for saying, you just can’t stop (his) beat. honestly I would rather watch something that’s more goofy. Alfredo is a dancer, which he shows off whenever he can, and we encouraged him to dance whenever we got the chance. He is super talented and a joy to watch. I think that a talent even better than his dancing is his ability to make anyone smile. He is one of the sweetest people I have ever met and I loved getting to know him. Alfredo - I’ll miss your dancing feet, your smile, your humor, and especially just your sweet demeanor. is a great finder of food. A talent for which we had much gratitude. to live off Cafe du Monde beignets, though they lack essential nutrition. is his major and his life from which he needed a vacation. Chris is so quiet, but such a presence. He is extremely smart, and always has something interesting to say. Since he was accepted in to the Iovine and Young Academy, it’s pretty clear he’s a smart guy. Though he was the only student that was not an English major, he had just as much to comment on when reading the novels as we did, sometimes more. Chris - I will miss your quiet demeanor and your talent for finding good food. As soon as she starts sining she goes on and on and on. Period piece? She saw it. We once spoke ill of Colin Firth, then she up and lost it. If you meet her, ask for Braveheart, it is quite the present. Morgan is the classmate that I have known the longest, having had a class together before. She was my first roommate and my travel buddy. What a hilarious person. I couldn’t begin to explain her, you just have to meet her to understand. Each day was a trip. Morgan - I will miss your humor, your stories of Boston, your childhood, and your frighteningly many near death experiences. Like the Tin Man to Dorothy, I might just miss you the most. Bowen, I believe it was you that asked for a haiku, so here it is. Apologies to everyone else wh probably won’t understand due to the inside jokes. Thinks he can eat it all. Nope. Bowen, Bowen, Bowen. We didn’t notice it until the end of the trip in Lafayette, but we are alike in many ways. He told me that we have a “love-loathe” relationship, his words not mine, and that it is because we are so similar. Bowen was more like a sibling on this trip; we bickered for fun and joked around. He is opinionated, and funny, and a gas to have around. Bowen was always talking in strange voices, referencing Star Wars and then explaining it to me since I haven't seen any of them, and generally just being Bowen. Again, not easily explained, you just have to meet him. Bowen - I will miss your weird voices, your blunt opinions, and our playful banter. Getting to know you was a highlight of my trip. By the way, we will never stop hounding you to sing Beauty and the Beast for us. fresh flown from the coup. Her eager enthusiasm is something you cannot dupe. where her infectious love of life renders each crowd in a trance. She loves her floppy sun hat. To her, ball caps fall flat. If she starts talking, I hope you have time, ‘cause man does she love to chat. I think I spent the most time with Stasi on this trip. She was my roommate for somewhere around fifteen days. She might be the youngest of the group, but don't let that fool you. She is way smart. She has such an amazing work ethic and positive attitude about everything. Though I might be older, she was definitely a good example for me (it’s easy to get sidetracked in a city as fun as New Orleans). Stasi - I will miss you, and your floppy hat. Your positive attitude brightened each day. If you noticed number 5 was missing, good job. I was number 5 on our roll call. We numbered off by age to make sure no one was ever left behind. We bookpacked to the Audubon Zoo and had a day of fun. There were plenty of cool animals there! Here are some videos of the animals saying what's on their minds. What a diverse group of voices! Quite the vocal bunch, right? I got the idea for these videos while watching the orangutans in the Asia exhibit at the zoo. A couple orangutans hung loosely from the structure, staring at each other, offering slight interactions but not very amiable towards one another. Beside me, a couple stood in each other’s arms, the boyfriend voicing over the scene in front of him, taking on the role of the male orangutan. He said something like “I’m sorry, it’s just not working out,” enacting a breakup between the orangutans. I tried holding in my chuckle listening to him, but my brain also took off on a tangent, pondering what animals would say if they spoke our language—to each other, to us, to themselves. I thought it might be a fun idea to observe each animal form then on and vocalize what I thought they were thinking. It didn’t take long for me to find a group of animals which provided an entertaining enough tableau to make me want to record a voiceover of “their” thoughts. I encountered the barasingha deer. A large group relaxed off to the side and a lone ranger, separated from the rest, drank water a few yards away. The group seemed very chill but judgmental and it felt like high school for animals. After this initial group, it became easier for me to spot these sorts of interactions. I saw the small tortoise’s repulsion to the camera, the restfulness of the jaguar, the defensiveness of the bird in the aviary towards an approaching bird. It was fun attempting to craft my own interpretations of their thoughts. It provided for a more thrilling experience than I expected. The zoo trip was a nice detour from the more “adult” stuff that we have experienced in New Orleans (educational museum tours, a sad but amazing plantation visit, BOURBON STREET). Although the rest has been just as fun, the zoo was a nice, spontaneous little treat; one that reminded me of some of the most important and exciting elements of visiting new places: having fun for the sake of fun and reinvigorating the childlike wonder that we often lose in the monotony of daily life. In honor of that, I felt compelled to write this silly, lighthearted, maybe funny (maybe not) post. Hope you’ve enjoyed it! I will certainly continue enjoying the fun that the Big Easy has to offer me. They eat a lot of shrimp. I think it's a gorilla named Casey (or KC). So cute! And big. Barasingha aka Swamp Deer... they're very cliquey. "Was I dreaming about Cheryl again?" Uh oh... let's hope they're not just food. They didn't want to turn around. They don't like humans, I think. 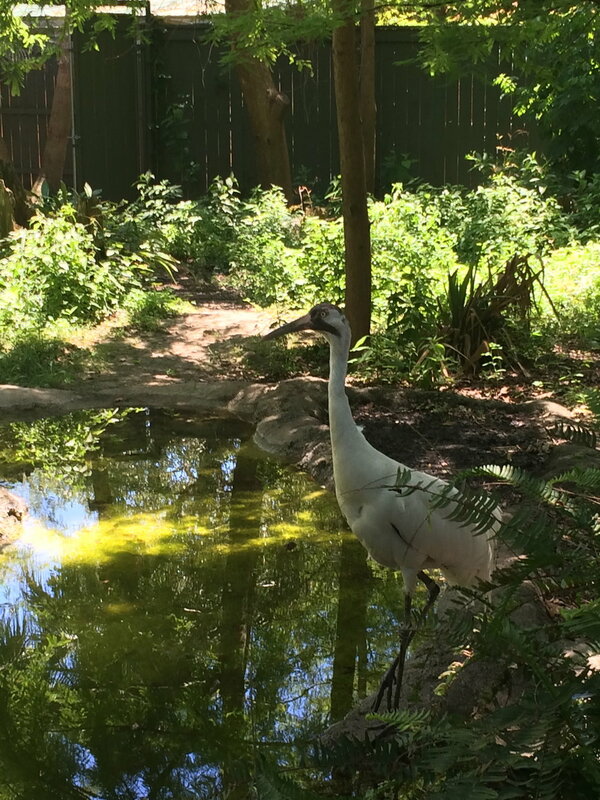 In which zoo can you expect to find a Louisiana Swamp exhibit? In a Louisiana zoo!